It’s Not Just Talk Therapy Anymore! There are many new and exciting techniques to break into anger, fears and negative thinking. The mental health field is changing rapidly with the event of the new Energy Therapies. Learn and use the different release techniques that focus on positive intention while working with your subconscious mind to create relaxation and balance the energy in your body. You can learn to apply these techniques at home on yourself! They are effective for anger management, stress, confusion, anxiety, phobias, depression, addictions, trauma, Post Traumatic Stress Syndrome, guilt, physical pain and enhancing performance and skills. All work equally well with anger issues. The Energy Therapies are highly effective in treating and correcting negative emotions and self-limiting beliefs reduce old hurts and create a healthy life. They work with the body’s energy system and relieve emotional pain. They provide release, insight, changes of negative beliefs and shifts in biochemistry. Many of them are based on Chinese Acupuncture concepts and use acupressure, which you apply to yourself. The research is coming in on these techniques regarding their effectiveness with clients. I’m been trained in all of the major traditional theories of psychology: Client Centered Therapy, Cognitive Behavioral, Hypnosis, Gestalt Therapy, Family Systems, Brief Therapy and Transpersonal Psychology. I use all of these techniques and they are very effective in their way. But talking about your problems is only part of counseling. I prefer the Energy Psychotherapies that move people along faster by processing and releasing negative emotion. Many therapists who are trained in one of these innovative procedures are trained in others. Cross training makes them more effective therapists. Therapists who have invested the time and money to learn these innovative approaches seem to be more open and caring than the typical mental health worker who uses traditional talk therapy methods. Energy Psychotherapy workers are therapists with a plus! This is my bias! After twenty years in the field, I’m entitled to having my opinions on what works well. If you are a therapist and disagree with me on this, don’t write me–get some training in one or more of these techniques and you will experience wonders. How Do I Find Someone I will Really Click With? Go to the web sites listed below to check out the different Energy Psychotherapies. Do your homework on line before calling for help. You can get referrals for counselors in your area from the web sites. Don’t be shy about asking for information when you call to make an appointment. When interviewing a prospective therapist, ask about their training in the area for which you seek help. Ask how many clients they have successfully worked with on the same issue. Ask them what their approach would be to a problem like yours. Ask them how they help the client process and release difficult emotions. Get a sense of their warmth and interest in your specific concern. Not having money is never the major issue to prevent getting professional help, although some people use it as an excuse. When people say, ‘I don’t have the money.’ I’ve noticed it is more a low self- esteem issue or a lack of motivation issue. People who are serious about getting help make it happen. Insurance plans of the 80/20 agreement and the HMO plans will pay for your sessions with your co-pay being under $20. If your insurance plan is 50/50, you might expect to pay out of pocket $40 or $50 per session. Call your insurance company to determine what benefits you have. You can also get a list of referrals for your area from them, but they will not have information about who does Energy therapies. If you want to see a clinician who is not in your insurance plan because you hear good things about him or her, go ahead and pay for their services. Talk to the person you chose about your financial situation. Some therapists have a sliding fee scale and are willing to give you a good deal. All therapists are not created equal! If you are merely telling stories in session or spending time blaming others in your life, you are not getting full value for your time and money. I prefer a clinician who makes you do something about your upsets, processes negative emotion and challenges you about ways of erroneous thinking that keep you stuck. A clinician who teaches you stress management skills is also a plus. You will know that you have the right therapist if you feel comfortable in their presence and they start getting down to the business of helping you change right away. You should start to feel better and learn some skills to make your life easier within one or two sessions. If you have had three sessions and you are not making changes, consider changing therapists. If your therapist seems bored, anxious or helpless in your presence, try someone else. You are the consumer of the services and want to get the best you can for your dollar. Do not just give up on your counseling after a few sessions and say, ‘Well I tried counseling and it didn’t work for me.’ Try someone else to see if his or her approach works better for you. Also check your own motivation. Are you willing to give your counseling the best that you have? Are you there half-heatedly and just show up hoping something will change. Take your sessions seriously. Really consider what the counselor is telling you. Do your homework as if you really want to get an A+ in this course. This is your life we are talking about! Give the therapy process a hundred percent. I used to be a fearful, depressed person and became physically ill. Then I started looking at the childhood traumas and the areas of my life that were out of balance. Today I’m a positive, productive, highly creative person working to make change in people like you who are looking for help. I had forty-four years of the unhappy life before I woke up and decided that my future depended on my getting straight with my thinking. With help from talented clinicians, I shucked off my old negative persona and started to soar. Now I give back to the Universe for all the abundance I’ve been given. As a psychologist, I’ve spent thousands of dollars taking training to learn about these new techniques. What a pay off on my getting a healthier life! The time and money that I spent on working on my mental health are the most important investments that I’ve ever made. Would I be any happier if I had used that money on a newer car, a bigger house or more vacations? I would probably still be the same miserable person with a negative errors of thinking that kept me caught in unhappiness. The benefits of my investment keep on growing and affect the happiness of my children and grandchildren. You can make your life a success too. With these new techniques that are available, there is no reason for you to go through life angry and miserable. Check them out and then make a decision to give yourself a great gift. Get some help for yourself. Don’t wait. Make the investment in yourself today. Think of yourself as a great project that you can pour information and learning into that pays off with high returns. You can work through your anger and feelings of injustice for what was done to you. Find trauma therapists who are trained in body/mind approaches to help you do this. You are certainly worth it. Remember, we are as happy as we learn to be responsible for our own thoughts, and behavior! Want a quick way to release stress, fears, anxiety, grief and addictive cravings? Sometimes our body just wants poking. Thought Field Therapy (TFT) and The Emotional Freedom Technique (EFT) are innovative procedures you can learn to use on yourself to release stress and quickly bring yourself in emotional balance. These tapping procedures break into the body’s energy system to eliminate emotional distress and unresolved issues. 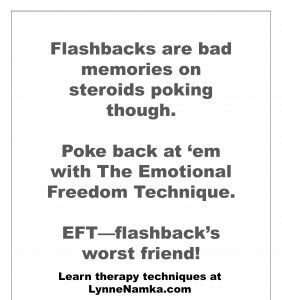 TFT and EFT demonstrate the power of the mind and the use of acupressure in releasing the negative emotions and beliefs that cause disturbances in your body’s energy system. The basic tapping technique was originally discovered to release phobias in a few minutes. It has been expanded to eliminate stress, anger, anxiety, jealously, rejection, guilt, addictions, grief and pain over love gone wrong. Acupressure on certain key spots helps clear the disruption in the energy meridians. Often the thought or belief about the issue spontaneously changes after doing the tapping. Most people are amazed at how fast these techniques work to break into energetic emotional blocks. This is speed therapy at it’s best! Children love to tap away their bad feelings and they do not have to do much talking about what upsets them. Every child in the world should learn this method of dealing with stress and problems. 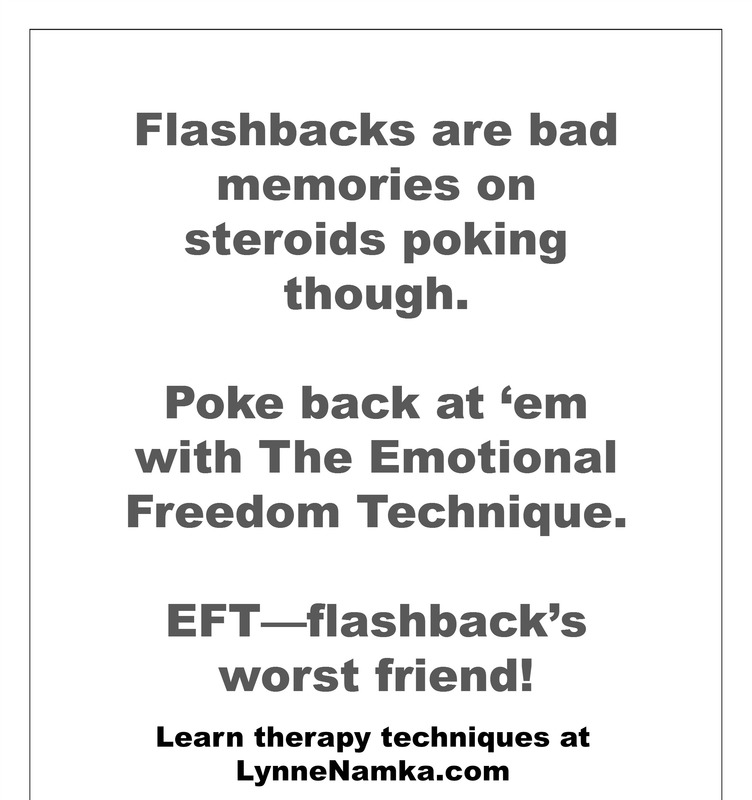 Every angry child needs to learn how to take his anger down by using EFT or TFT. These effective techniques can be done via phone long distance with a trained therapist. You can also learn to do the Emotional Freedom Technique on yourself at home via the many articles on the web or from YouTube videos. EFT can be used to eliminate any unconscious obstacles to success. I use EFT more than any other technique to help people resolve their stuff quickly! Remember, when it hurts, just poke it! Tap often on any and all problems and troublesome emotions. Roger Callahan is the originator of the first energy technique originally called Thought Field Therapy now called The Callahan Techniques. Check this fast clearing technique out today. Eye Movement Desensitization and Reprocessing (EMDR) is a revolutionary process, which was developed by psychologist, Francine Shapiro to release trauma and uncomfortable emotions stored away in the body and mind. 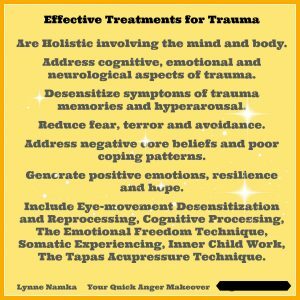 EMDR has been used with many different types of problems including Vietnam combat problems, trauma due to natural disaster and sexual and physical abuse. EMDR is also helpful in releasing uncomfortable memories of being criticized, embarrassed and shamed by others as well as being unmotivated or stuck on emotional issues. It works with any type of disturbance or habit including anger as old repressed feelings come to the surface and are released. After a while, the negative feelings begin to shift and start to disappear. The reprocessing part of the technique allows for quiet time for positive messages to come from the unconscious mind. Clients often report that what they were concerned about no longer seems to be an issue. EMDR allows for the right and left side of the brain to connect giving more energy and brain power to see a negative situation differently. It works with brain neurology to help gently cut through the psychological defenses that have been built up. New pathways in the brain open up which allows for greater understanding of the issue. Children are intrigued to simply follow the movement of body states and emotions as they process an issue and follow the gentle rhythm of the eye movements. EMDR has been used with children to show them how their negative internal body states and negative self-statements set up avoidance of doing homework. EMDR has been well documented by numerous research studies. Many clients report that they get release from things that have bothered them for a long time and are able to move on in their lives. The Tapas Acupressure Technique (TAT), developed by acupuncturist Tapas Flemming, is a simple method that helps people release information about what is bothering them by holding certain acupressure points on the forehead and back of the neck with their fingers. By holding points, focusing on an issue and requesting information and a positive outcome, the energies release. The front and back of the brain is connected and brain rhythms become balanced. The former problem is no longer a concern. 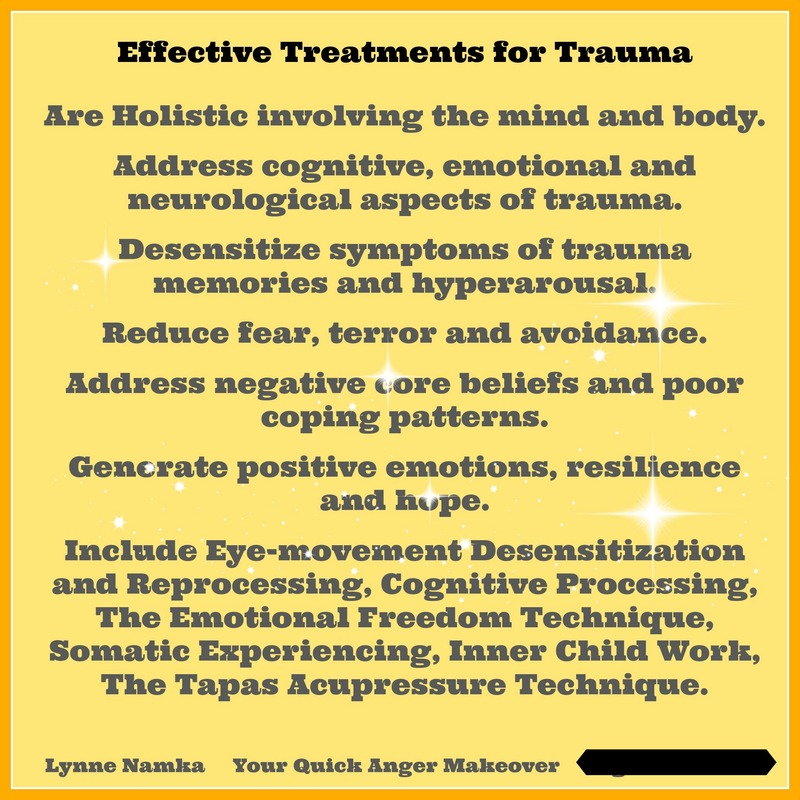 TAT is an accelerated information processing technique, useful in the treatment of trauma, anger, stress, allergic reactions, and fixed negative emotional states. TAT is the sweetest technique. I use it daily and see people change. There are many more new energy psychology approaches that have been developed that you can go to workshops to learn. The Association for Comprehensive Energy Psychology (ACEP) is an international non-profit organization to promote professionally responsible Energy Psychology treatments, and facilitate collaboration among practitioners, researchers and licensing bodies.